Last year, co-creators of OutOxford Jonathan Kent Adams and Blake Summers, in collaboration with the Sarah Isom Center for Women and Gender Studies and the Powerhouse, came up with the idea of an art show that celebrated the local LGBTQ community. 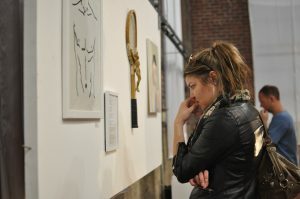 This past month, that idea came to fruition in the form of the Big Gay Art Show. 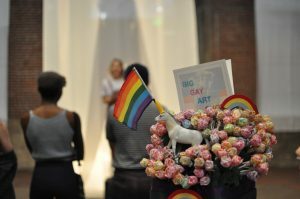 The first Big Gay Art Show is up and running for the month of September, boasting more than 50 pieces, and the reception was held at the Powerhouse from 6 to 8 p.m. Tuesday as part of the Oxford Art Crawl. The exhibit will be up until the end of the month. This will be the first fine art exhibit that OutOxford, which Summers and Adams started to bring more opportunities for LGBTQ exposure in Oxford, has sponsored. A long-time artist, Adams reached out to some younger, lesser-known LGBTQ artists, including Deja Samuel and Jake Thrasher, among others, from the Oxford-University community to show their work in the exhibit. 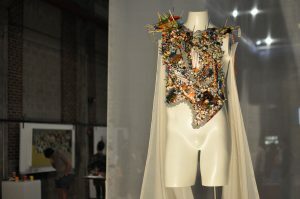 The result is a combination of 10 artists’ varied work. The exhibit features everything from ceramics to photography, and each piece ties together the show by sharing the overarching theme of the exhibit — the queer person’s experience in the South. Around 300 people visited the reception Tuesday night, taking part in the welcoming, introspective atmosphere. The exhibit challenges viewers from all walks of life, exposing them to a version of Oxford’s collective queer identity. Senior chemistry major Jake Thrasher, who is featuring two of his pieces in the exhibit, emphasized the important of a queer art show in the small community of Oxford. “I think art exhibits that show diversity, especially in small towns, have a large impact on the perception of the town to insiders and outsiders,” he said. Adams has a “sassy” self portrait piece in the exhibit that summarizes his thoughts toward our modern political environment and how that has already shaped the LGBTQ identity of the South. The exhibit also documents important moments in LGBTQ history in Oxford, like the first gay pride parade two years ago. The duo hopes that people from all walks of life will leave the exhibit with changed perspectives. In the political climate of the nation and the community, it is more important than ever to Adams to bring the local community together using his passion for art.